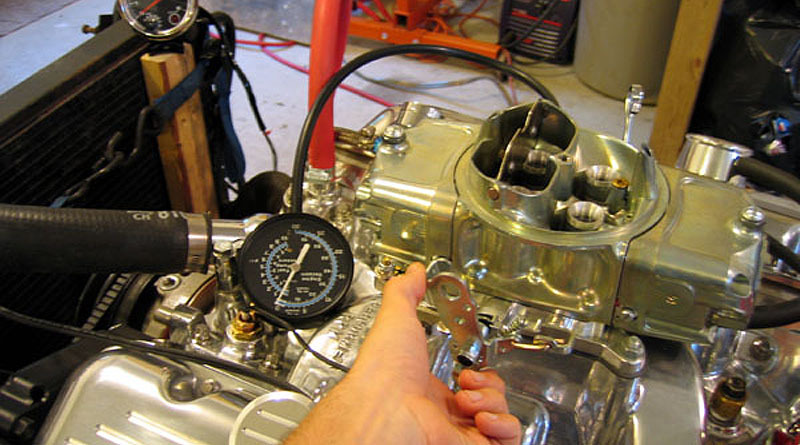 Engine Startup – Bringing the Engine Back to Life! Well, after about 250 hours of toiling away on my rebuild project, the 454 fired back to life this weekend! I was pretty pleased with the way things went, the motor fired up without too much effort and after a bit of quick tuning it ran quite well. At an idle speed of 800 RPM the oil pump is making about 40 psi of oil pressure and the engine is developing about 12 in-Hg of manifold vacuum. Oh yeah, and it sounds SWEET! So, after starting the motor, scrambling around making sure everything was OK during the initial startup, I was able to take a video for everyone. My digital camera didn’t take great quality video, but you’ll get the idea. And, while I don’t usually do this, I’m going to hit the fast forward button and move us forward ten years. It’s hard to believe it took that long, but that’s how long it took me to finish the body work and have the engine reinstalled in the car. Here’s a brief video of engine running in the final installation. Granted, the car still isn’t complete, but you’ll get the idea of how it came together. So what’s next? Well I think a trip to the engine dyno is in order. I’m real curious to see how much power this thing will put out! Stay tuned for an update soon. In the meantime, you have any questions on the engine build or the restoration to date, I suggest stopping by the Corvette Restoration Forum and asking – that’s the easiest way to contact me.